Summer on a plate, try with some freshly whipped cream. In season raspberries and blueberries can also be used. Sieve the flour into a bowl, and add the butter and sugar. Combine with your fingertips until the mixture resembles breadcrumbs. Slowly mix in the beaten egg and stir until the pastry comes together in a ball (you may need to use a teaspoon of water or two). Place the pastry in the fridge to rest for at least 30 minutes. Take the pastry out of the fridge and roll it out until about 0.25cm thick. Line a 9 inch pastry tin pressing the pastry into the edges. Place in a cool place for 20 – 30 minutes to prevent shrinkage at a later stage. Bake blind by lining with greaseproof paper and filling with dry lentils. Bake in the preheated oven for 15 – 20 minutes, remove the greaseproof paper and lentils and return to the oven for 2 minutes. Take out of the oven, and set pastry aside while you prepare the filling. In a bowl, using a handblender whisk the egg yolks with the sugar until light and creamy, then add in the flour. Pour the milk into a pan and bring slowly to the boil, remove immediately from the heat. Add the vanilla extract to the milk and pour over the egg mixture, whisking all the time. Return the mixture to the pan stirring all the time with a whisk over a low – medium heat until it comes up to a gentle simmer. Continue to simmer for 2 minutes or until it has thickened. If the mixture goes a little lumpy, remove from the heat and whisk well, alternatively push it through a sieve. Remove the saucepan from the heat and pour into a bowl and cover with cling film to prevent a skin forming. Once the Crème Patissiere has cooled pour over the pastry shell and carefully arrange your strawberries to cover the entire tart. Heat the strawberry jam with the water. 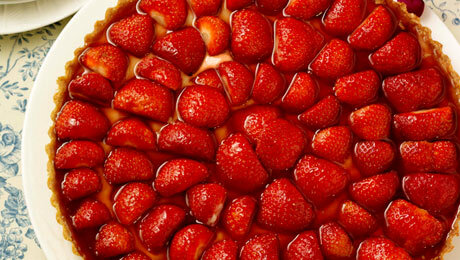 Brush the strawberries with the glaze and allow to set.